This is a simple rice dish that I adapted from a more complicated Indian Pulao recipe and tailored to my personal taste and time constraints. This dish can be made in about 30 minutes and can be served as a side or main course. Wash the rice in a sieve under cold, running water until the water from the rice runs clear. Drain the rice and put in a saucepan or rice cooker. Add cinnamon stick and cardamom pod to the rice and tuck down inside the rice. Add the coconut milk and water to cover the rice by ½ inch. Cook rice until done, about 20 minutes. 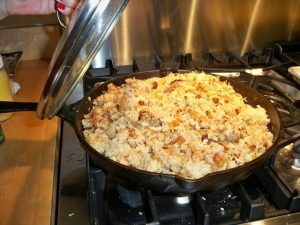 While the rice is cooking, place a frying pan over medium heat and add about 1 teaspoon olive oil and 1 teaspoon butter. Sauté onion until golden, about 10 minutes. Add sugar and toss. Continue to cook for about 5 minutes more, tossing or stirring until onion is caramelized. Remove onion from pan and set aside. Add small amount of butter/olive oil to the pan and reheat. Add the raisins to the pan and cook raisins until puffed. Turn off heat and swirl in pistachios. Combine with onions. Remove the cinnamon stick and cardamom pod from the cooked rice. Stir the onion-raisin-pistachio mixture into the hot rice. If you like, you can add a Tablespoon of butter or coconut oil to the cooked rice for additional flavor; it’s a matter of taste. When ready to serve, sprinkle with roasted coconut chips or serve as is.